When David Gelsthorpe, Curator of Earth Sciences at Manchester Museum came to Maggie's Manchester to deliver a talk as part of the Facing Out programme of events, centre visitors were expecting to see some interesting fossils. They did see fossils, and they were interesting, but what they also discovered was the fascinating life story of a pioneering female scientist whose work in Manchester blazed a trail that influenced antarctic expeditions, led to pit owners naming plant species and freed women to plan their own families and take ownership of their reproductive rights. The woman was Marie Stopes and David told her life story through the objects that he brought with him from the museum. We learnt of her formidable intellect and strength of personality that saw her able to break through into the male preserve of scientific academia, how she used coal balls to identify new species of fossil plants and how she won a scholarship which led to her travelling to Munich where she fell in love with a Japanese scientist only to be spurned by him when she attempted to be reunited with him in his home country. 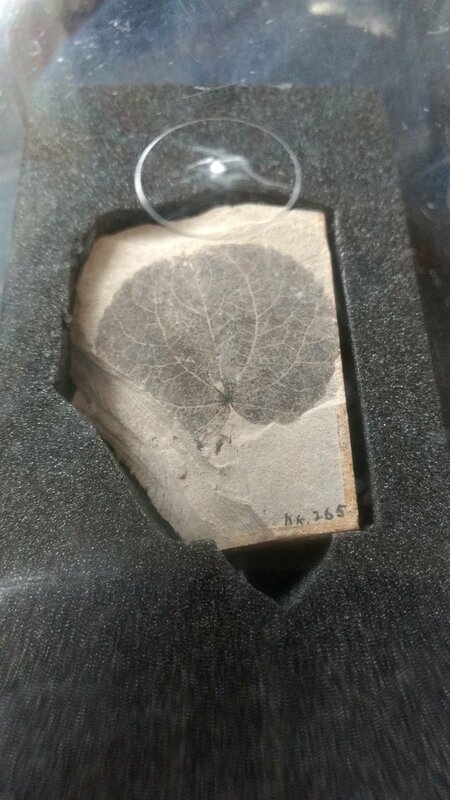 Not miss an opportunity to further her research, she used her trip to Japan to collect exquisite plant fossil samples laid down in the uniquely suited environment of a still, volcanic lake. We saw the veins in ancient plants that must have thrilled Mary as they did us. Back in Manchester Miss Stopes was introduced to Captain Scott at the Manchester Museum. We know this happened- David found his signature in the Museum's visitor's book! Unable to persuade him to let her join him on an expedition, she did convince him to find examples of the plant fossil record on his expedition to the antarctic, adding to the proof that the continents were once joined and formed a super continent. When Scott's body was recovered after his fateful mission to be the first people to get to the South Pole failed, plant fossil specimens were found near his body. We may have heard of Mary Stopes and how her pioneering work led to the introduction of family planning as we know it, but hearing about her fearless quest to fulfil her academic potential and pursue her scientific interests was as inspirational as it was fascinating. Thank you David. What a fantastic story to share with the centre visitors at Maggie's and what a fantastic way to de-stress, by being led on a story back in time and around the world!